Julian Nacol, upon completion of his Naval service, commenced his college career and graduated from the University of Texas at Austin in 2013 with a Bachelor of Arts degree in Philosophy and a Minor in English. Following graduation, Mr. Nacol immediately commenced his studies at Texas A&M School of Law and graduated with a Doctor of Jurisprudence in 2016. While at Texas A&M School of Law, Mr. Nacol served as president of the Federalist Society and interned with the Federal Public Defender Office in Ft. Worth, Texas. Julian Nacol was admitted to the practice of law in November 2016. 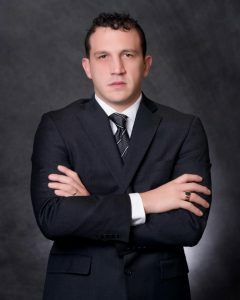 Julian Nacol joined The Nacol Law Firm in Dallas, Texas in May of 2016 after graduating from Texas A&M School of Law. Julian clerked with this firm during summer breaks during his tenure at the University of Texas. Julian was a court runner, paralegal, law clerk and now is an Associate Counsel of the Nacol Law Firm.